Get the WOW factor into your presentations. Experience an impact with your presentation like never before. PremiumSlides PowerPoint Templates are easy to use and come with 8 predefined colors. Join the winners, who trust us. PremiumSlides Templates are used by many global companies. The quality, simplicity and design is outstanding. That's why leading companies trust PremiumSlides templates. 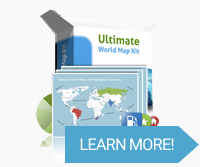 Create Perfect Maps in Minutes! 14 pre-designed Color Themes are already included. 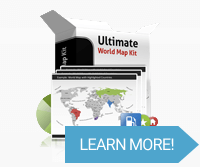 Saves you time while creating your maps. No software plugin needed. All countries and states are fully editable in size and color. 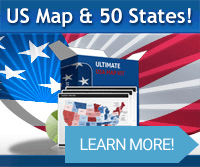 Create maps for regions and sales data with just a few clicks. Welcome to PremiumSlides. Your shop for high quality PowerPoint Templates. PremiumSlides.com started in 2010 offering PowerPoint templates to their clients through the online shop. We received great feedback about quality and support and began to enhance our portfolio. PremiumSlides creates and develops all slides in-house. We do not outsource our work to low-wage countries and still produce in Germany to guarantee high quality and competent support. The ppt and pptx files can be downloaded instantly after purchase. We also store your purchased files on your customer account, so you can come back and download your maps and slides again at any time. In just 3 Steps you will be ready to work with PremiumSlides templates. Every day we focus on our customers, their needs and requirements and incorporate their feedback into our work. We are interested in a long-term business relationship. Maybe that's why the world's greatest companies trust PremiumSlides presentation templates. Always deliver premium quality presentations. We do not take shortcuts when creating our slides. Try us! We are here to help! We send updates of the same version! We create slides that are easy to use. If you have any questions about our products or our company please contact us using our contact form. PremiumSlides - Create stunning presentations today! Easiy, fast and with great results!